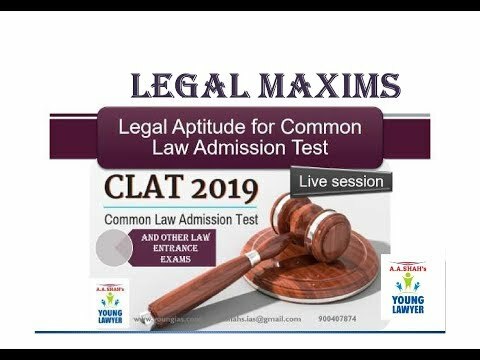 Common Law Admission Test (CLAT) is a centralised test for admission to 21 National Law Universities in India. 43 other education institutes and two public sector institutes are also eligible to use these scores. 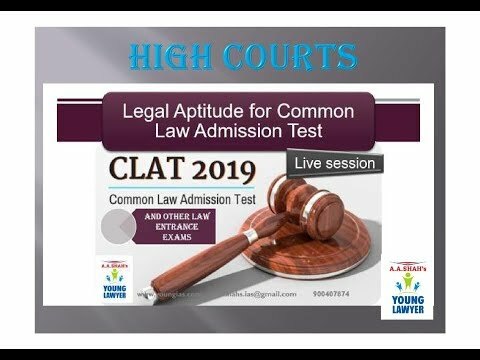 The test is conducted every year by one of the 21 participating law schools in rotation, in the order of their establishment, starting with National Law School of India University which conducted CLAT-2008, and up to National University of Advanced Legal Studies which conducted CLAT-2018. The test is taken after the Higher Secondary Examination or the 12th grade for admission to integrated undergraduation programmes in Law and after Graduation in Law for Master of Laws (LL.M) programmes conducted by these law universities. CLAT 2019 is expected to be conducted by NLU Odisha, Cuttack on May 12, 2019. Before you start your preparation it is important to understand the pattern of the examination. The exam will be conducted in offline mode where the paper will have 200 questions from five different subjects including English (Comprehension), General Knowledge & Current Affairs, Elementary Mathematics (Numerical Ability), Legal Aptitude and Logical Reasoning. Following is the distribution of the questions of each of the five sections. Therefore the exam consists of a total of 200 questions, which are to be attempted in 120 minutes. So, the aspirant has less than a minute per question!!!!! Each question carries 1 mark and for every incorrect attempt, 0.25 marks will be deducted. Mathematics: This section will test candidate’s knowledge on elementary mathematics, i.e., maths taught up to 10th Class/standard. THE ELEPHANT IN THE ROOM: HOW TO PREPAPRE? Let us now examine how to prepare for these sections. This section consists of questions based on vocabulary, comprehension etc. Vocabulary can’t be enhanced overnight and hence requires a consistent effort. While you are trying to enhance your vocabulary, it is also important to understand the usage of the new words that you have learnt. The dictionary is a good source learning new words, but reading it becomes a rather monotonous task. Therefore reading newspapers, magazines and novels helps you learn new words in an interesting way. Further, reading a lot will help you increase your speed of reading, which is useful while solving the comprehension type questions. You can also Work on vocabulary by learning Synonyms and Antonyms, this way it might help learning quickly as you work upon few words, but you add double to your vocabulary. Just like vocabulary learning grammar is a continuous process and requires consistent effort. Also, remember that, good command on language and good vocabulary are the strengths of a good lawyer. Just like English, General Knowledge cannot be tamed overnight. A grasp over static portions such as History, Polity, Economics, Geography and Science will help you solve a sizeable chunk of the section. The best source to study current affairs is the newspaper. But remember that you need to revise what you study. Making notes from the newspaper is a tedious task and also consumes a lot of time. Here the monthly current affairs magazines come in handy. Such magazines are published by various institutes such as the AA Shah’s IAS Institute (www.aashah.com). For static portion one can refer to books such as ones by Pearson’s publications or Lucent. Further learning G.K & current affairs becomes fun, if you solve questions based on the portions that you have studied. Mathematics, which involves basic mathematics from 10th standard, forms a very small portion of the paper, but skipping this would be a mistake!!! 20 easy questions are a sure shot way of pocketing those marks. ‘Quantitative Aptitude- R.S. Sharma’ will help you through the exam. Practice is the key to score well in this section. Candidates should go into the depth of constitution and polity, since it forms a significant part of legal knowledge. The first three topics, that is, Law of Torts, Contracts and Criminal Law are a part of legal reasoning. The list is not exhaustive. Like mathematics, the saying, ‘Practice makes a man perfect’ holds true for this section as well. If you are short of time for preparation (considering that now we have almost three weeks to go for the exam!!! ), focus more on mathematics, logical reasoning and legal aptitude. These sections can be prepared in lesser duration of time and one can score well with some practice. Don’t focus too much on basics, develop on the concepts that you already know. For the aspirants who have not been reading the newspapers on a daily basis, monthly current affairs magazines are the Holy Grail as they provide relevant information in a concise and crisp manner. Solve a good number of test papers. Before you go for the final exam, it is important that you solve a good number of mock tests to understand your strengths and weaknesses. It will also give you an Idea about where you stand with respect to the preparation and help you avoid silly mistakes during the exam. Focus on speed and accuracy. Dearth of time and negative marking increase the difficulty level of the exam. Practice will help you increase your speed. Master short tricks and direct formulae foe maths to save time. To increase your accuracy try to solve questions using elimination, i.e., try to understand why the other options are incorrect. Nothing beats hard work and patience. Consistent hard work is the key to success. Study hard and work towards your ultimate goal. Revise the syllabus well before you go for the exam. Finish the syllabus well in time before the exam. To help you prepare for CLAT-2019 “A A Shah’s Young Lawyer” program brings to you live video sessions with experienced faculties, free of cost and at convince of your own home. These live video sessions are broadcasted through our YouTube Channel. 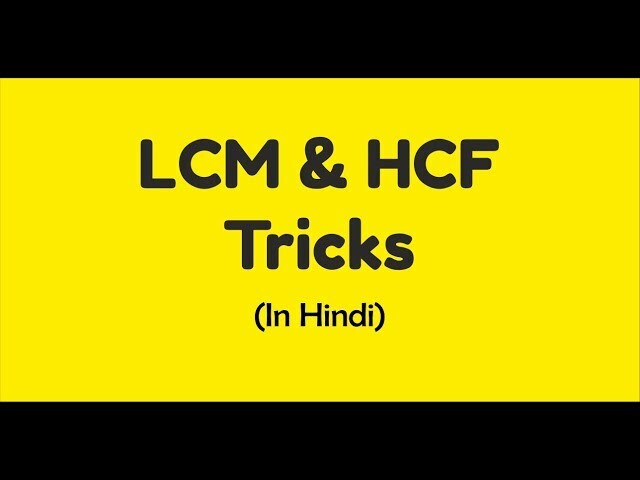 Subscribe our channel using the link given below for quality content to help you crack the CLAT Exam-2019. 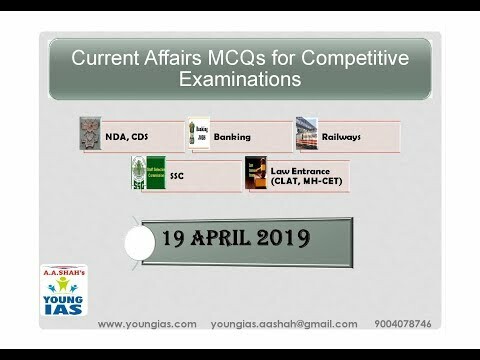 "A A Shah's Young Lawyer" a unit of "A A Shah's IAS" announces Free Daily live sessions of questions discussion and explanation of all subjects of Law Entrance Exams, namely Legal Reasoning, Legal Aptitude, Logical Reasoning, Current Affairs, General Knowledge, Maths, English, which is beneficial for law aspirants of CLAT, MH-LL.B 5 Years CET, DU-LLB, LSAT India, AILET etc. This free daily program runs at scheduled time and it is live to enable the aspirants to participate and clear doubts in real-time. This is a golden opportunity for all 10th, 11th, 12th appeared students, who have not yet decided which course to join or who are planning to go for law courses, as in this free session they understand the syllabus, difficulty level and assess their interest and capability. Subscribe our YouTube channel and share the link to your friends and relatives. For the first time in Mumbai NDA (I) 2019 Question Papers discussion; solution with explanation by experts, experienced and popular faculties in classroom lectures. Faculty Santosh Kumar: Graduate in Mathematics from Delhi University, Post-Graduate in Mathematics from IIT Delhi, Doing PhD in Mathematics from IIT Mumbai. Qualified, experienced and popular rank holder who has qualified and secured (i) All India Rank 17 in Mathematics (MA) and 126 in Mathematical Statistics (MS) in IIT-JAM entrance exam conducted by IIT's for M.Sc. admission. (ii) All India Rank 132 in CSIR-JRF - June 2017 exam conducted by CSIR in Mathematics discipline. (iii) All India Rank 67 in CSIR-NET - December 2017 exam conducted by CSIR in Mathematics discipline. (iv) All India Rank 596 in GATE 2018. (v) NBHM Mathematics Written Exam in 2015 and 2016. In this video I try to teach you some Simplification Problems. This Maths Problems can help you any Competitive Exam like SSC, Bank, Railway, RRB, UPSC etc. 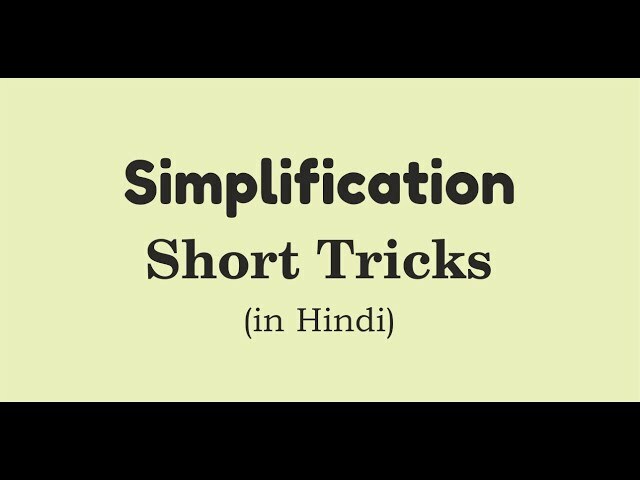 Simplification one of the most common chapter for every competitive exam. In this video I teach you special type Simplification Method that's can help you to solve special type Simplification Questions. 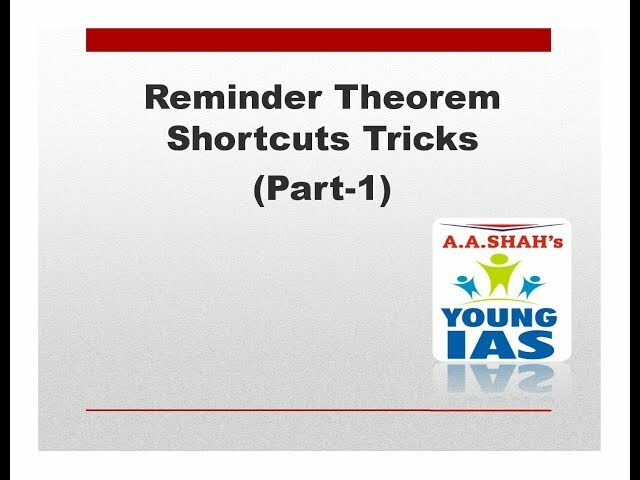 In this video you will get to know advance and other tips,tricks,shortcut and concept for remainder theorem. How to find remainder in seconds by different methods. 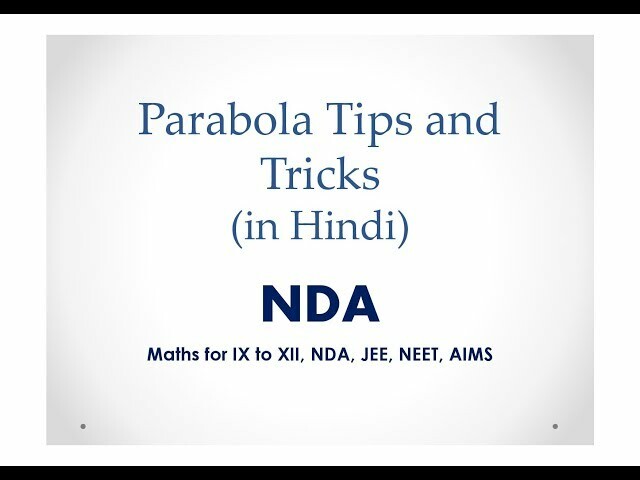 You will get to know various important theorem under remainder theorem in this video such as polynomials,factor theorem, totient method, rational functions and all others. So watch till the end and get benefited. Classroom courses and Online Courses are available.